Global Assimilation of Information for Action (GAIA) is a new initiative at The Johns Hopkins University connecting decision-makers with the research community. GAIA's focus is on climate disruption and its effects on society. The key to the GAIA approach is building connections through a series of topical cyber-enabled workshops. These workshops feature a structure that brings together people from a wide range of disciplines to exchange ideas and information, to assess and prioritize needs, and to develop approaches to addressing those needs. 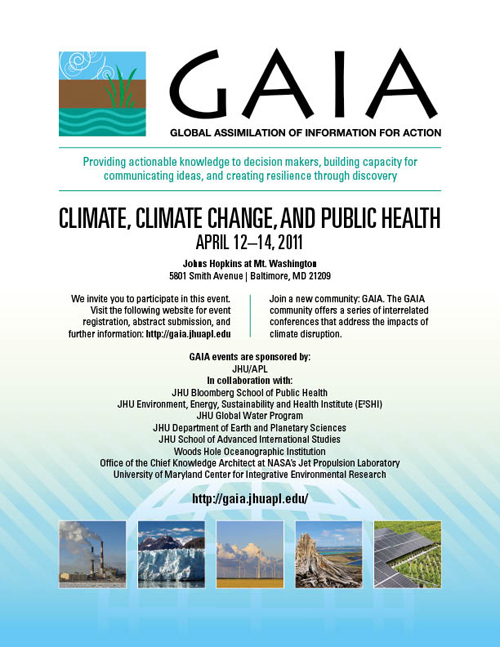 The first GAIA workshop, Climate, Climate Change, and Public Health, was held April 12–14, 2011, in Baltimore, MD at the Mt. Washington Conference Center. Attendance consisted of a diverse group of academics, health practitioners, journalists, policy makers, and students. The workshop featured both small, cyber-enabled working group discussions moderated by subject matter experts and invited speakers that provided broad overviews of climate change subjects. The GAIA event was structured as an investigation of several related themes, with the working groups developing their top issues as point papers. These point papers can be used for further action and to generate collaboration. This document summarizes discussions held during the working groups and gathers the key ideas in order to develop more detailed point papers at a later date. 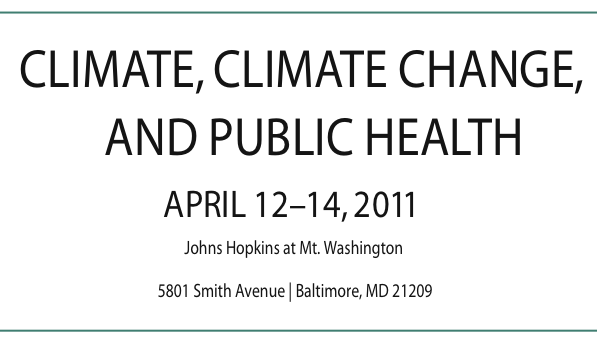 Public health is often described as being comprised of four pillars: prevention, science, care for the medically underserved, and interdependence.1 Climate disruption due to global warming will have environmental impacts such as worsening air and water quality, increased frequency of extreme weather events, and resurgence and/or spread of infectious diseases. Today, billions of people lack adequate nutrition, access to a viable public health system, and potable water. With the climate disruptions yet to come, further challenges are expected to impact more countries in more regions of the world. Different regions will face different problems as the climate continues to change, but such impacts don’t respect political boundaries (e.g., air pollution) and are globally interdependent (e.g., the import and export of food).